The Indonesian community of Perth, under the umbrella of the Western Australia Indonesian Catholic Community, recently demonstrated its strong support for our St Mary's Cathedral Project and Appeal. The Community hosted a special charity dinner on 31 August at the Jade Restaurant in Northbridge. We gratefully acknowledge that this event was also supported by the Indonesian Government through its Consulate here in Perth. "I am delighted to say that more than 200 tickets were successfully sold for this event. Our community's fundraising efforts were boosted by the admission fee guests paid to join the dinner, proceeds from a charity auction and from a number of generous donations received on the night. In keeping with the sacred nature of the Cathedral Project, we auctioned on the night a sizeable image of Mother Theresa painted by an Indonesian artist and a statue of The Blessed Virgin Mary. 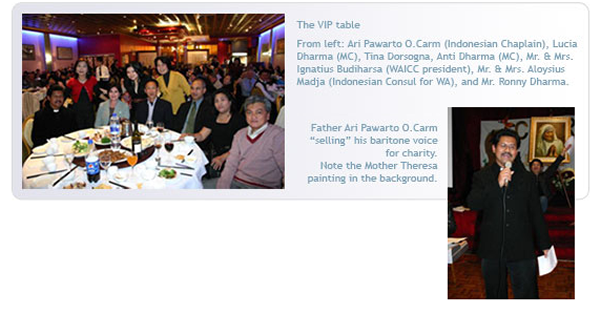 A surprise late addition to our auction list was the voice of Indonesian Chaplain, Father Ari Pawarto O.Carm...bidding for this special item was fierce and Father Ari performed two songs much to the delight of everyone. I am very pleased to report that an amount of $17,000 was raised to help support the St Mary's Cathedral Completion Project, which was above the expectations of our organising committee. I thank everyone from our community who worked so hard to make this night such an enjoyable and successful occasion and I would also like to express thanks to Tina D'Orsogna for taking the time to join with us"
NOTE: Tina D'Orsogna is Chair of the St Mary's Cathedral Multicultural Gifts Subcommittee.